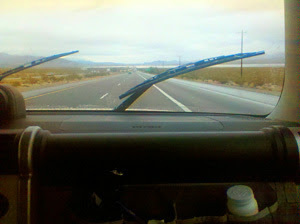 Steve and I started our journey to Utah under extreme conditions. 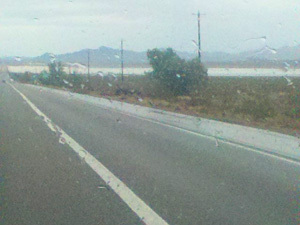 It was just pouring here, but we thought we could beat the storm by getting ahead of the rain in the desert. The wet weather was stalled here near the coast, so we felt we had a good chance of hitting the trail without all the mud. The mud was there in the desert and it was thick and in all the wash-outs. I was surprised there wasn't more sand. Where did all the clay come from? The roadways changed to detours, so our GPS went completely nuts "Make a right turn at the next exit" over and over. Steve finally just turned it off and we just relied on Steve compass brain, dead reckoning, to make our way out of California. Our FJ Toyota was so great. We had to go in 4-wheel drive and all by itself it did some posi-trac and wheel articulation when we attempted to climb out of so many rock and holes near Victorville. I have to say, by the time we had to take so many alternate roads, we ended-up right in middle of the storm. We enjoyed the crazy weather because we didn't have any idea of the rising havoc in area of Northern Arizona and St. George. I was really feeling guilty for enjoying the rain. A bit like saying that an earthquake was just a roll and glad the fault was letting-off pressure, but now I know someone, somewhere most likely felt a huge jolt. There was wonderful light snow around us as we went higher in altitude. I didn't get carsick as usual and Steve made a sudden unscheduled stop by the side of the Virgin River in a wide area and said, "Open this." I said, "I can't, I don't want to open my gift early." "I won't have a present for Christmas." Then as I saw the box, I got so mad at him. I thought my dear husband had wrapped me present in my son, Dustin's camera box. There was no way I was getting a camera just like his, and seeing it was like giving our daughter, Larin, a plastic horse head, when she wanted a real horse for Christmas. Larin, I will always be sorry we did that. Charlie at the Mill, wanted you to have it. I should have thought more about it. Soooo, I did feel your pain until Steve said that the box was real and he wanted me to take pictures now. I needed to know how to take pictures before Christmas and during our trip up the valley. The next words outta' his mouth was, "Take your finger off the shutter!" OOPS! 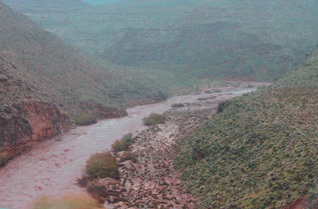 500 pictures of the Virgin River. Here's three of the whole 8 GB. Always Muddy? 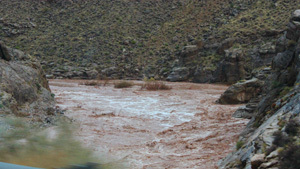 Bad Time to Hike The Narrows! 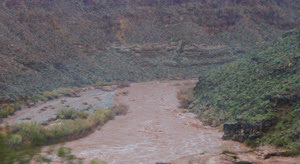 Do you know why it is called the Virgin River? Because nobody has ever seen it's bottom.